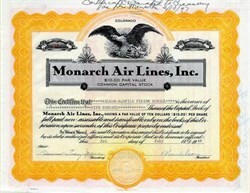 Beautiful RARE certificate from the Monarch Air Lines, Inc. issued in 1946. This historic document was printed by the Bradfor and Robinson Company and has an ornate border around it with a vignette of an eagle. This item has the signatures of the Company’s President, Ray M. Wilson and Secretary, Donna Tracy Myers and is over 67 years old. This is the first time we have had a certificate from this company for sale and we only have one. The certificate was issued to the Wilson - Bonfils Flying School. On the top of the certificate it is written in pen " Certificate Donated to Treasury as per Minutes 2/10/1947. Monarch Airlines, based in Denver, Colorado, started scheduled air service on November 27, 1946 with a flight from Denver to Durango, Colorado using a Douglas DC-3. It was formed by F.W. Bonfils of The Denver Post family and Ray M. Wilson, who operated a Denver flying school. Other services started to Albuquerque, Salt Lake City and Grand Junction. Monarch pioneered all weather operations in their service area by installing its own navigational system. By 1948 the airline was sharing several functions with Challenger Airlines such as maintenance and sales at Denver. Then Monarch bought controlling interest in Challenger in December, 1949. After graduating from flight school at Brooks Field, San Antonio, Ray received his commercial pilot's license in 1927. 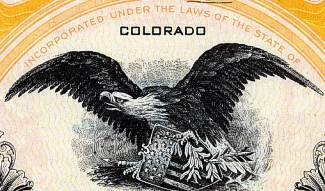 From 1924, he was associated with the 120th Observation Squadron, Colorado National Guard. While he managed the Park Hill Airport, he opened the highly successful Ray Wilson Flight School. In 1946, Wilson founded Monarch Air Lines, which later purchased Arizona Airways. The company joined with Challenger Airlines and ultimately became Frontier Airlines. -Citation at Colorado Aviation Hall of Fame. Ray M. Wilson died on May 11, 1979 in Denver, CO at age 78. He was born Sep. 2, 1900 and started with Monarch on Jan.1, 1946. Donna T. Myers died on Jan. 23, 2001 in Aurora, CO at age 85. She had been executive secretary to Ray Wilson and other executives. She was born Mar. 22, 1915 and started work at Monarch on Jan. 1, 1946. Her husband John was one of Monarch's original pilots.